Review date: 25 October 1999. Microsoft have managed to cause a stir in the normally unexciting world of mouses with their IntelliEye models. These are optical mouses, but not as we know them; they need no special mouse-mat, and work on pretty much any surface. A regular mechanical mouse, with a ball, has two little rollers at right angles to each other, attached to axles which each have a slotted encoder wheel mounted between optical sensors on one end. The secondary purpose of these rollers is to turn the encoder wheels in response to the rotation of the mouse ball, and thereby let the mouse know where it's going. The primary purpose of the rollers, as any regular computer user knows, is to collect dirt. Traditional optical mouses get around this problem by putting the optical sensors on the bottom of the mouse, looking down, and using a special mouse-mat that gives them a nice regular pattern to look at. Without the special mat, or something that looks pretty much like it (a photocopy of the mat will do, for many opticals, and a newspaper photo is better than nothing), they don't work. In theory, making an optical mouse that doesn't need a special mat is simple enough. You just need to put a downward-facing camera in the mouse, make it take lots and lots of pictures per second, and have enough on-board smarts in the mouse to tell where the image is going, and turn that into regular movement data. Actually doing this, though, requires a whole lot of processing power, not to mention some rather advanced optoelectronics. If someone puts all of that stuff in a freakin' mouse it is, I think, safe to say that you're living in a decadent society. Microsoft's IntelliEye mouses have the teeny camera, taking 1500 shots per second. And they have the computing power; the camera's output is dealt with by an 18 million instruction per second (MIPS) Digital Signal Processor (DSP). 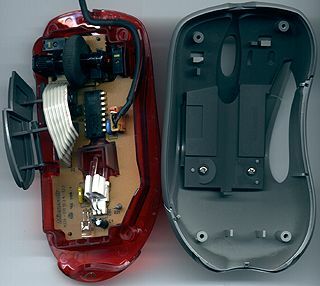 A quite startlingly bright light emitting diode (LED) obliquely illuminates the area immediately under the tiny camera lens, which peeks through an oval cutaway in the bottom of each mouse. The slanting light makes slight irregularities in the surface under the mouse more obvious, which makes it easier for the mouse to track on even single-coloured surfaces, as long as there's a little texture there. The IntelliEye system can't track on shiny surfaces, or dead flat ones, and it may have problems with surfaces featuring really repetitive patterns, like magazine pictures. But pretty much any ordinary desk or mousemat will work. Footprints. From top to bottom, a plain Logitech USB wheel-mouse, the Explorer and the IntelliMouse. The Explorer is big, and feels bigger; the Logitech is longer than the IntelliMouse but feels smaller, because it lacks the IntelliMouse's bulbous hindquarters. Incidentally, if you're a fan of EverGlide's super-slick plastic mousemats (I am - read the review here! ), be advised that the white ones work poorly, if at all, with the IntelliEye mouses; the EverGlide plastic is translucent enough that the mouse can see practically no detail in the surface. Fortunately, you can now get black EverGlides, which work fine. The black EverGlide pads work fine with the IntelliEye mouses. There are two models of IntelliEye mouse. 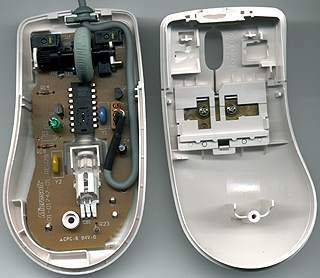 The basic IntelliMouse has exactly the same asymmetrical shape as Microsoft's previous "ergo" IntelliMouses, and the same two button, one-wheel design, with the wheel also "clickable" as the third button. The only giveaway besides the IntelliEye printing is that these mouses return to the old shiny white finish, as opposed to the frosted beige of the opto-mechanical IntelliMouses. The wheel also has rather nice grip ridges, for extra traction. This plain model sells for $79 (Australian dollars), versus $55 for a plain OEM USB opto-mechanical IntelliMouse. The IntelliMouse Explorer, on the other hand, is in no danger of being mistaken for any other mouse ever made. It's a great big silver and grey monster more than 130mm long (about 5.25 inches), with a peculiar but quite comfortable shape which incorporates the same two top buttons and wheel, and another two side buttons for thumb operation. The side buttons can be set to do various Windows-ish things, using the included driver software; if you bind them to key commands (like, for example, Page Up and Page Down), and then bind functions in the game of your choice to those keys, you can use the extra buttons in the game. The Explorer sells for $90 (Australian dollars). One note, right off the bat: the Explorer is not a mouse for left handed people. The stock IntelliMouse is slightly right-hand biased, with an oversized left button, but its asymmetrically bulging shape actually feels only mildly peculiar for lefties. You might not like it, but you could use it easily enough if you had to. The Explorer has even-sized buttons, but they're tilted slightly to the right, and a left-hander will find that the two side buttons don't fall under any finger at all. It'd be hard to press them by accident, because it's close to impossible to press them at all. The curved left side means a leftie would have to curl their pinky and ring finger around to grip the mouse, which is pretty much an ergonomic disaster. The Explorer is also not a mouse for those with petite hands. It's a lot easier to use than its remarkable size suggests, but only, I think, if you've got normal-to-big-sized manipulatory appendages. The manually subnormal might do well to pick a more svelte computing rodent, like the slimline basic Logitech models, whose simple symmetrical shape and low tail make them easy to use for anyone but Andre the Giant. What the Explorer clearly is, is a mouse for the show-off. It could have been beige, or black, but no; it's silver. And the bottom is see-through red plastic. And there's another, completely unnecessary, LED installed to shine out the back. The plain IntelliMouse glows a bit; light leaks through the button seams on the top, and a little gets out around the bottom. But the Explorer glories in its glow. If it were a car, it'd be a lowrider. Both of these mouses are USB devices, but they come with a green plug adaptor that lets you use them with a PS/2 mouse port as well. 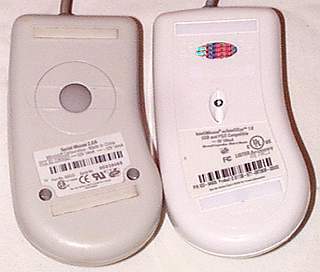 Old versus new; the basic IntelliMouse shape remains the same. This is rather clever, because USB and PS/2 are completely different interfaces. You can't just make a pin-to-pin adaptor to use a USB device with PS/2; it's not like plugging an old-style DIN-plug keyboard into a newer PC. Like the older model mouses that worked as both serial and PS/2, the IntelliEye models are smart enough to deal with both kinds of interface. Their adaptor won't let you convert any other USB mouse into a PS/2 one, but it makes the IntelliMouses a plug-and-go proposition on PS/2 systems. If you use them under the more elegant USB interface, though, you'll need to install the included software the first time you plug the mouse in. You'll need to do the same thing if you want to set up the Explorer's buttons, or use any of the other IntelliMouse software features, when you use the PS/2 interface. The software installation is easy enough to do and requires no rebooting. Incidentally, USB is a huge boon to mouse reviewers. You can plug in two, three, four - heck, as many mouses as you have USB ports. They all work at once, so it's easy to put one aside and try another, then swap again. Doing this with regular mouses is just impossible without hot-swapping PS/2 devices, which you're not meant to do, on pain of possible motherboard damage. Serial mouses aren't even in the running; they use an appallingly low sample rate on Wintel systems, and there's nothing you can do about it (PS2Rate, from here, lets you wind up the sample rate on Windows PS/2 mouses). In operation, the IntelliEye mouses feel pretty much like any other mouse, only lighter. There's no obvious sign of inaccuracy on any surface except the reflective and dead flat ones the mouses don't work on at all. And, needless to say, they never get dirty. The plain IntelliMouse feels like its opto-mechanical brethren; the Explorer feels big, but not uncomfortable. Then again, I'm a right-hander with average-sized hands; your mileage may vary. The super-bright LED illuminator automatically dims when the camera detects no movement for about a second. This happens when the mouse is sitting still, or when it's lifted off the pad. Touch the mouse at all, and the light goes back to full brightness. While it's still at full brightness, the LED is quite dazzling; if you want to startle the person at the next desk, you can flash your mouse at them! OK, so what's inside these things? 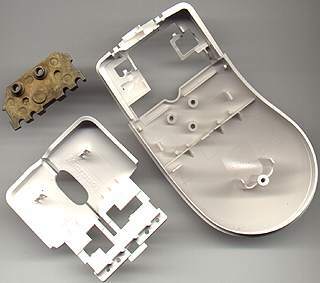 The plain Intellimouse is held together by one screw hidden under the rear foot-pad; peel off the foot, undo the screw and you can hinge the lid up and off. You'll need to take a little care when peeling off the plain mouse's foot-pad so as not to bend it. Inside, there's not a great deal to see. The camera chip and illuminator LED, with plastic light-guide, replace the opto-mechanical giblets of the regular IntelliMouse. Inside the lid, though, there's an oddity; a neatly cast chunk of brass, screwed in for weight. The two retaining screws that hold the brass in place are easy enough to remove, and the button assembly is held in with plastic clips. You can reassemble the lid without the brass, and the mouse still works fine, but weighs less. Presto, one lightened sports-model IntelliMouse! With the weight removed, I found the plain mouse quite reminiscent of the slim-line optical mouse I used to use with my Amiga, way back when. I don't mind super-light mouses, but plainly Microsoft think most people prefer to feel a bit more substance. The difference isn't large, in any case. Opening the Explorer is a little more complex. The smaller feet on the Explorer are easier to remove. This is just as well, because this mouse is held together by four screws, one under each foot. The side buttons make the Explorer's case a bit harder to pop off, but once you've done it you'll see it's not really much more complex inside than the plain model. The extra weight of the Explorer's more complex design means nobody found it necessary to put lumps of metal in it. Since the circuit board is just clipped in, though, dedicated loonies who can't leave well enough alone could easily enough replace the rear-facing LED with a another ultra-high-intensity one, or a flashing one. Blue or white LEDs would probably be out, since they need more voltage than red ones to light. Awwww. The people most attracted to the IntelliEye mouses are, probably, gamers. Not having a ball to clog up is a big plus all by itself, and the Explorer's show-off looks and extra buttons are attractive, too. But there's a problem; these mouses can't track fast enough for some gamers' tastes. The reason has to do with the way they see the world. The area peered at by the tiny IntelliEye cameras is not large. The oval aperture sits almost dead flush on whatever surface you put the mouse on, and it's less than 8mm (maybe 5/16ths of an inch) wide. So, in order for there to be any common features in the images created by the camera, the mouse can't possibly have moved more than 8mm between images. Given that there are 1,500 images per second, this gives a maximum possible mouse speed of 12 metres per second, or better than 43km/h (about 27 miles per hour). And you're not going to move the mouse anything like that fast. But this is the speed below which at least some of each camera image, assuming that it's of an 8mm wide circle, will be in common with the previous image. The DSP in the mouses isn't magic; it needs some overlap to tell where the mouse is going. And its imaging size isn't necessarily as big as the biggest circle that'll fit into the oval aperture; as a matter of fact, it can't be, because the image sensor is square and can thus be 8mm only in the diagonal direction. A square with an 8mm diagonal has sides of about 5.7mm. And if you allow for, say, a 30% minimum overlap between frames (which, I'd just like to say, is a number I pulled out of the air), the maximum distance the mouse can travel between frames drops to less than 4mm. Now, any mouse movement faster than 6 metres per second can't be properly tracked. This is still considerably faster than you're ever going to move the mouse, so there shouldn't be any problems, right? Wrong. Apparently, the field of view of the camera is rather smaller again, or the DSP needs a lot more inter-image overlap, or both. Because it's perfectly possible to whip an IntelliEye mouse across your mousing surface fast enough that it mis-tracks and steps the pointer back, or flicks downwards, or does some other random thing. In ordinary Windows computing, this just doesn't happen. You can see it if you vigorously wiggle the mouse back and forth, but it takes some effort, and normal pointing and clicking is fine. But when you're playing a first person action game, you often twitch the mouse very quickly to, say, turn 180 degrees to nail that guy that just shot you in the back. If the mouse mis-tracks slightly and doesn't turn you the way you expected - or does, but leaves you staring at the sky or your feet - it's a big pain. You can get around the problem if your game of choice lets you set the mouse speed high enough that a smaller twitch does the job, but an over-sensitive mouse brings its own problems, like general inaccuracy that makes sniping impossible. There thus doesn't seem to be any way around the tracking speed issue for "twitch" gamers, other than Microsoft changing the hardware for a bigger field of view or higher sampling rate, or both. 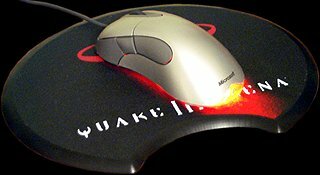 Then again, it's not necessarily going to be a problem for you, even if you play a lot of Quake-type games. I've played first person games with the IntelliMouse and had no problems. Then again, the Rail Gun Legend next to me was using an Explorer, and kept complaining about its propensity for mis-tracking. We were both using black EverGlide Attack Pads, so that wasn't the problem. If you don't play twitch games, you definitely won't have a problem with an IntelliEye mouse. If you do, you might. Given that the IntelliEyes will never, ever, mis-track because of hand salsa accumulating on rollers, the maybe-slightly-too-low maximum tracking speed doesn't seem like a bad deal to me. I think far more shots have been missed because of dirty opto-mechanical mouses than will ever be missed because of optical mouse glitches. Incidentally, the Explorer's remarkable size also makes it a bit big for smaller mouse pads, like the Attack Pads and the 3M Precise Mousing Surface. You just can't go very far up or down before the feet fall off the edge of the pad. Larger pads, like for instance pretty much every free promotional mousemat ever made, are fine. Any mouse that's a different shape from the one you normally use will feel weird, and the Explorer may well take longer to get used to than most odd mouses. My personal favourite mouse shape is still that of the slim-line basic Logitech models, but I don't mind the IntelliMouse shape either. The Explorer is certainly not an ergonomic disaster, but it may not suit you if your hands are small. And, as mentioned above, it's not for lefties. For regular desktop mousing and all but the most extreme games, these mouses track magnificently. And I'm sure that most users will never move them faster than they can handle - well, not on purpose, anyway. If you like the idea of having more processing power in your mouse than you could buy in a PC a few years ago, and you're sick of cleaning mouse rollers, and you (optionally) want to own the slammed neon-decked '74 Impala of the mousing world, the IntelliEye models are for you. They're more expensive than opto-mechanical mouses, but they're better in almost all respects. Recommended. Aus PC Market don't sell these products any more. Click here to see their current mouse-related products. ...but are you a serious poseur?